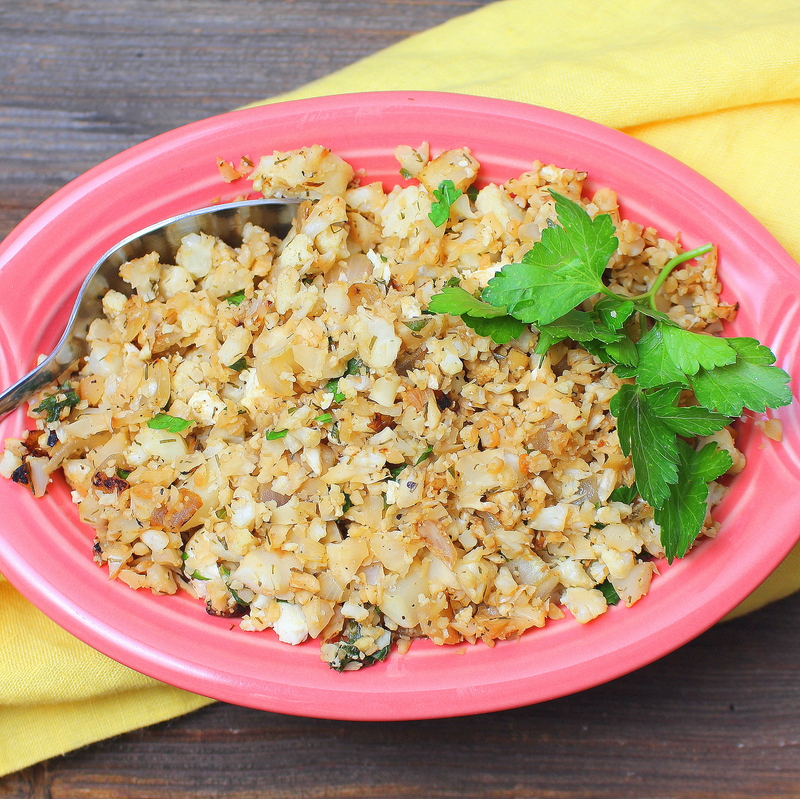 A low-carb alternative to rice pilaf, made with cauliflower instead, is the perfect Greek side dish. 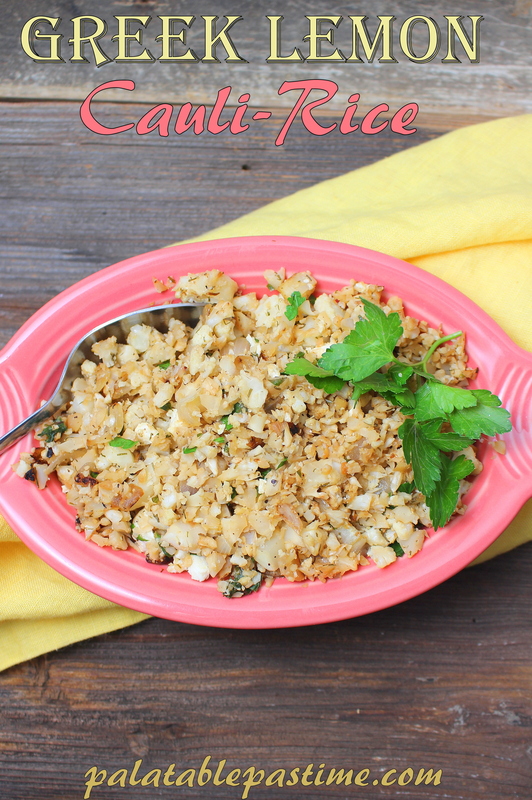 Today is the last day for #RecipeMakeover.For today I am offering up my recipe for Greek Cauli-Rice (Cauliflower Pilaf) which is tasty while being very low carb. The cauliflower is easy to chop into rice and makes a great healthy alternative to ordinary long grain rice. I first did this recipe some time back when I was adhering to Weight-Watchers. It also is very good for diabetics watching their carb intakes. I think it makes a great side dish. This has been such a great week, and I want to thank our sponsors and the ladies at PinterTest kitchen once again for allowing me to participate in this great gig. The giveaway is still on so sign up for that if you have not already done so. Who doesn’t like to win free stuff? The sign up is below, along with the linky party showing the last of the #RecipeMakeover recipes the other bloggers posted for today. Make sure you scoot on over there and give them a peek. Join me tomorrow for a day of “Chef’s Surprise” (aka I have been so busy I haven’t decided what is going up on the blog). But I have a thick stack of recipes here that I haven’t posted yet. I’ll dig until I find something good. Sunday I’ll be posting with the #SundaySupper group- this week it’s Cinco de Mayo all the way, and I’ll be sharing my recipe for Chicken Tinga Chalupas. All next week I am hosting a #MexicanRecipes event with my blogging friends- we’ll be having a bit of a fiesta all week long so join us each day for those Mexican, Tex-Mex and southwest recipes everyone loves. It doesn’t have to be Cinco for that. We eat that kind of food all the time! Join me each day! Pulse fresh cauliflower florets in a food processor until it is like rice (I have also seen this stuff at Trader Joe’s for sale in bags if you want to skip this part, but it is easy enough to do). Saute the onion in the butter or oil (I use half butter, half oil) until it softens. 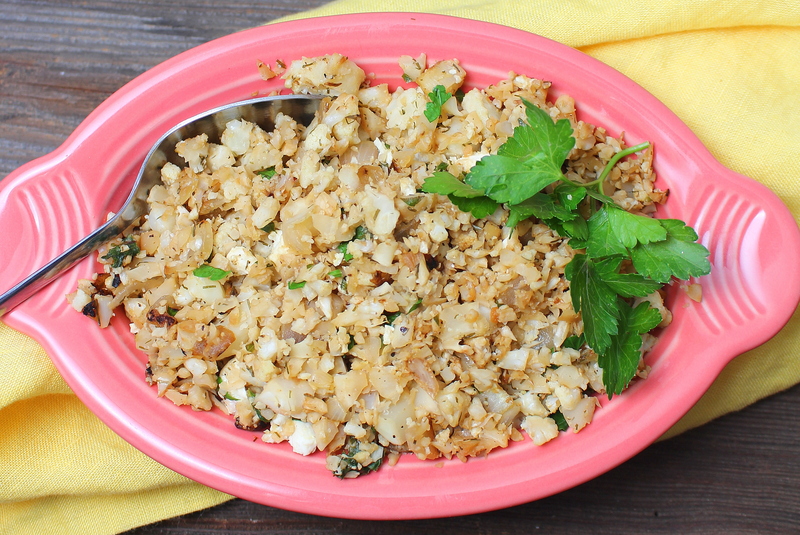 Add the cauliflower rice and garlic and saute for 3-4 minutes. Whisk together the chicken base into the lemon juice and add that to the pan along with the herbs, salt and pepper, cooking a couple minutes more or until as tender as you like. Stir in the cheese and serve. This week, I’ve joined forced with 40+ of my food blogger friends to present #RecipeMakeover. During this week, we’ll all be sharing our favorite better-for-you alternatives to unhealthy dishes. Follow along on any of the blogs below or with the hashtag on social media to find nutritious dishes that are packed with flavor. Each daily linky party has different recipes in it from Monday through Friday so if you’d like to see the others, refer to the linkups in the blog posts earlier in the week! What a perfect side dish Sue. Looking forward to next week.